THE CAVE OF SHOOTING - 1998 - Dangun Feveron / Fever S.O.S. The shooter genre parodies itself. To do this, CAVE surprisingly did not follow the treaded path of cute characters and skyblue-pinky candy environments. No, the programmers of Dangun Feveron created serious shooter graphics of the same high-end quality like they did for DoDonpachi i.e. and mixed them with a funky 70ies disco-music score ! The weaponary and some weird animations support that glitter age as well. 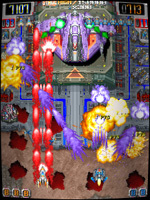 The player chooses between 3 spaceships, which are different in shape and in the spread level of their main weapons. It goes from close up to a very wide. After this selection you choose beween 3 different charge shots. These are A: The 'Lock-On Type' tracking ray, B: 'The 'Bomb Type' Rockets, or C: The 'Roll', a spiral expanding ring of energy balls, similar to a weapon in Toaplan's 'Vimana'. Depending on which charging weapon you choose, you will automatically change your gameplay later. So, finding your prefered weapon means finding you prefered way to beat the game ! The 3rd selection screen sets the movement speed of your spaceship. A useful option as well. To enhance your main weapon in the game, you can collect two different power-up items. They upgrade the center and the wide shots seperately. Hold the [A] Button to use the earlier selected charge shot. Button [B] releases a mighty smartbomb in shape of colorful disco dancers. This weapon differs in style depending on the type of spaceship you fly. Like in newer pinball games, the score numbers you receive in today's shooters are sometimes quite absurd. Maybe on the top of that list: Takumi's 'GigaWing 2' where you get average scores of 16 digits! Obviously CAVE avoided to follow this path as well: In Dangun Feveron you start with a reward of only 1 point per ship. By collecting the red "Cyborg" medals you can increase it by one by one. But you will have a hard time to catch all of them, since they bounce off exactly one time before they leave the screen.